Last summer, I wrote an effusive post on Kalga that ranks either 1st or 2nd on most related Google SERPs and gets dozens of readers every day. Towards the end of this summer, I ended up there again with a friend. As a matter of fact, we first went to Tosh and I disliked it the moment I set foot in the village. Prices are two times more than what they should be and everything seemed too jam-packed and squalid. 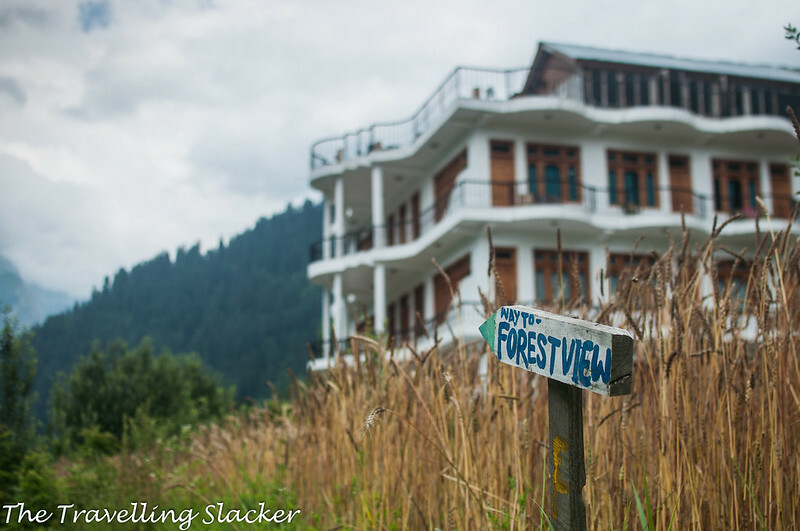 There was a reason why I’d avoided it so far in spite of visiting Parvati Valley so many times and I am not even going to write a post about Tosh. So, the next day we quickly left Tosh and found reached Kalga. 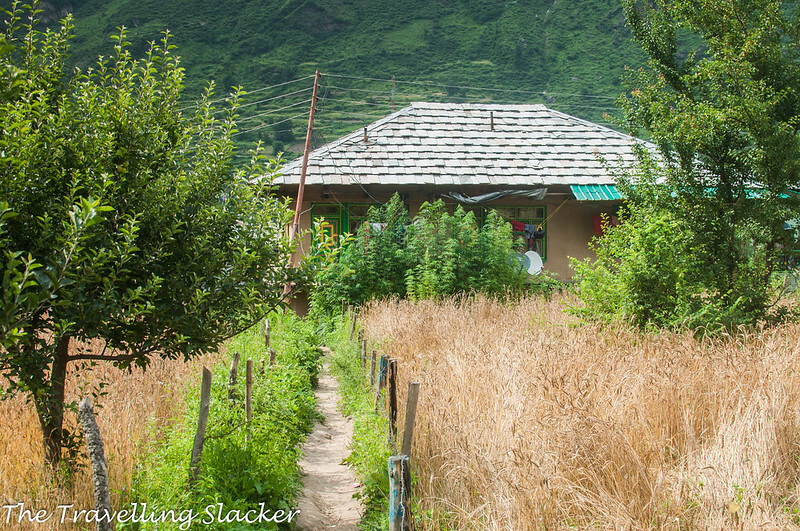 More homestays seemed to be have come up here too but still, Kalga remained the cheapest and cleanest part of the Parvati Valley. Now, Tulga and Pulga are two nearby villages that can be easily reached from Kalga. However, last time I made myself so comfortable in Kalga that I did not even have the motivation to try that short hike to the nearby village. So, this time I decided to pay a visit to Pulga. We could also stay at Pulga but since we had a lot of luggage, we kept the room in Kalga and made a day trip to Pulga. There is a direct road connecting the villages. One can also reach Pulga from Barsheini, the last point where the buses stop. However, if you are starting from Kalga, there is no need to go back all the way to Barsheini. 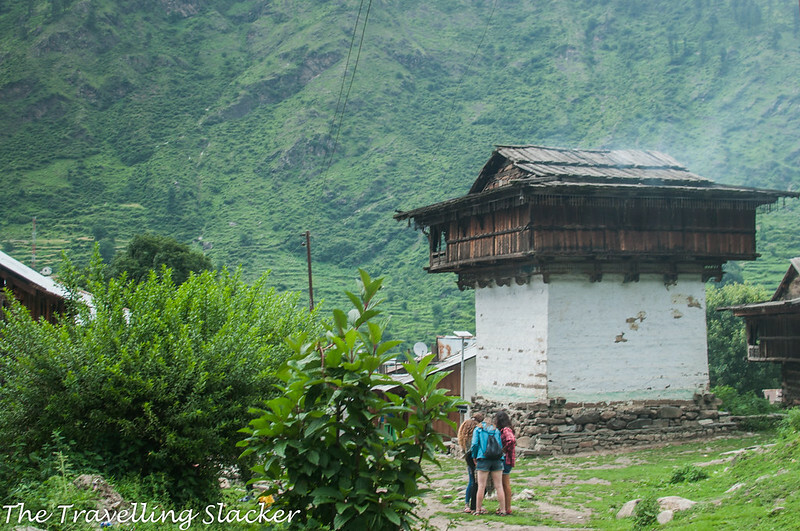 Initially, we were also not sure but after a while, we realized it as we saw some other people coming our way from that village. We crossed a bridge or two over the river and soon found the trail to the village. It was not a tough hike although we stopped for photographs here and there and eventually reached the village in an hour and a half. The first thing I noticed was that it was a far more densely populated village compared to Kalga. In fact, the initial parts of the village felt perilously similar to Tosh. But for some reasons, it seems to be more popular among Western (Read Israel) visitors. So, shops selling toilet paper are as common here as their Hebrew signboards. It felt better as we moved past that congested portion and reached the more spacious rear of the village on the edge of the forest. There were a couple of bigger, newly built buildings, clearly targeted at the tourists, located amidst fields of wheat and apple. We stopped for some food and inquired about what is known as the “Fairy Forest” although it sounded a bit too good to be true. Anyway, they asked us to keep walking and cross the village to reach the forest. 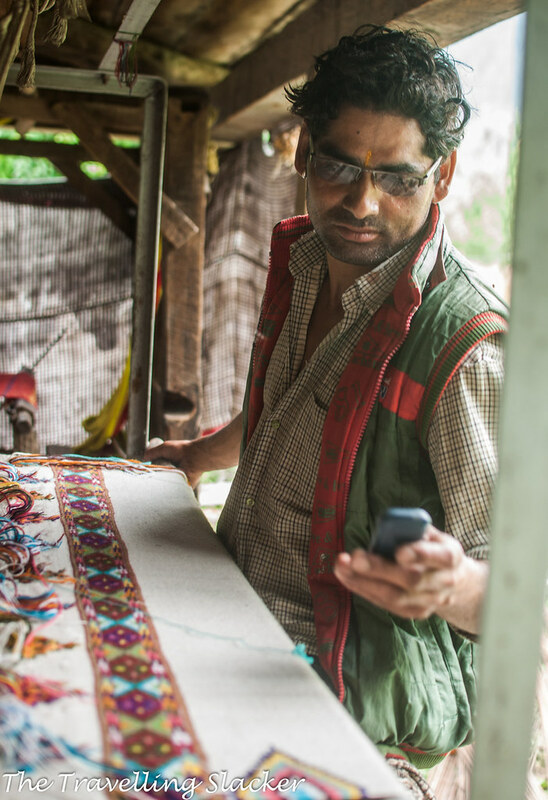 On our way, we stopped at one old wooden house where a man was weaving colorful shawls with his ancient hand loom. But we could not have any serious conversation because he also seemed to be doubling up as a beekeeper. Assaulted by his bees, we could not last long there although he was eager to show his work. Surprisingly the local children seemed perfectly fine with the bees. We walked fast after that point, crossed some abandoned wooden houses and eventually reached the so called Fairy Forest. It was a nice area but as I’d suspected, there was nothing ethereal about it, unless you consider the sight of some white youngsters playing guitar amidst pine trees to be ethereal. This is basically the start of the steeper mountains beyond the village. But there is a somewhat flat portion out there where one can enjoy a good siesta under the conifers. I think this is what attracts people and make them come up with fancy names like this. There is also a reasonably big waterfall beyond the forest. It eventually meets the river near the main road. I could see it through dense foliage but could never get a clear shot. Apparently, I had to climb up a bit for a better view but that day I was not really up for too much hiking. We decided to return to the village after an hour or so. 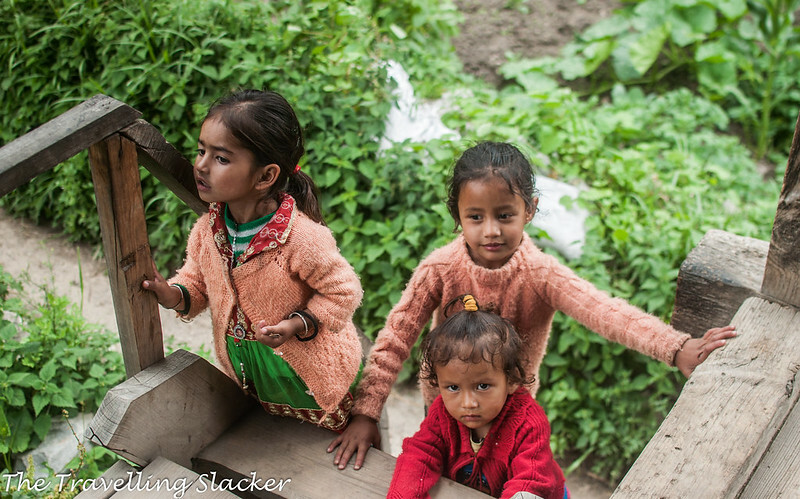 We met the same kids again, but this time they were busy picking apricots. 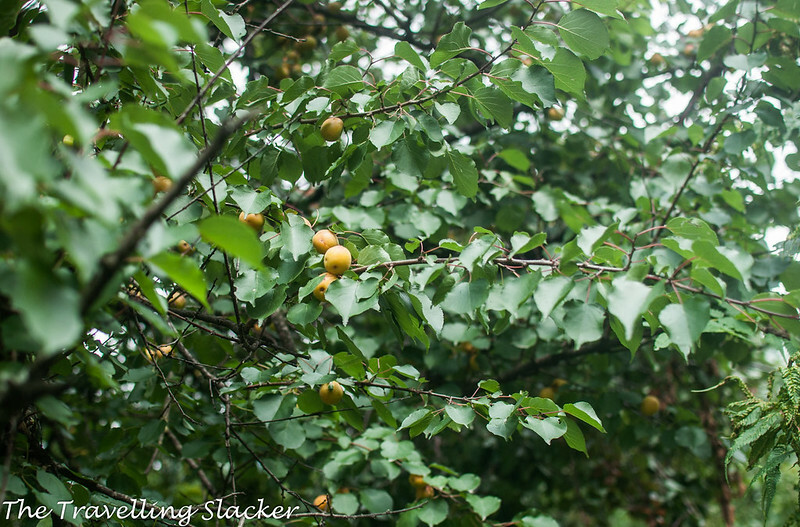 While the apples were still green, the season was right for apricots and it seemed that the “plant that must not be named” was also enjoying a good season here. Although it looked straightforward, we somehow got lost for a while inside the village and reached a strange shop with many severed heads, plastic ones of course. It is run by a couple who are definitely not natives of the village, one can tell from their looks and accent. They apparently sell those hippie dreadlocks, not sure how they even came up with this business idea! 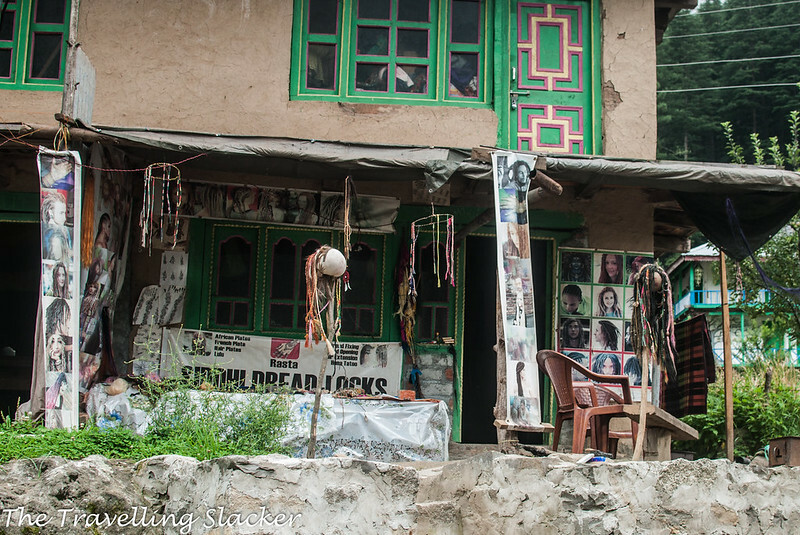 Also, I used to think those were people’s natural hair but now I think most of them in and around Kasol just get these ones as a shortcut to acceptance in the hippie society. As a side business, they also make tea. So, we ordered tea but it was not satisfactory, which hastened our return. We had to negotiate some more confusing alleys while coming out of the village. 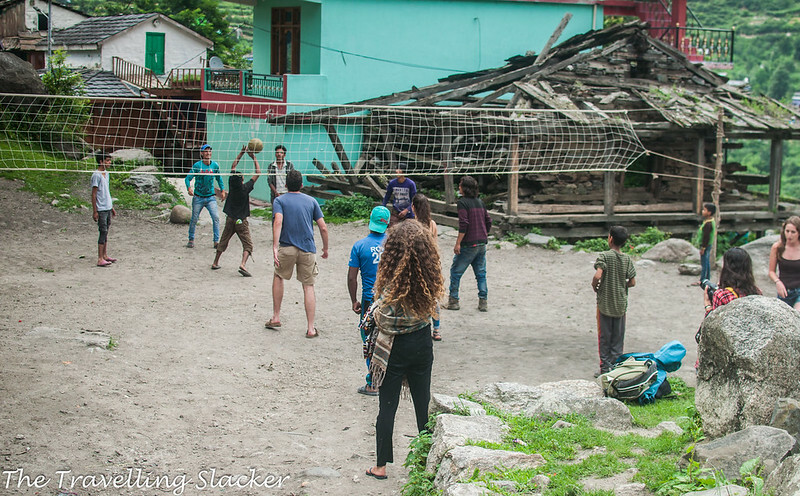 We came across a tower temple, common in the Kullu region, and a volleyball ground that could well be hosting an India-Israel match only if the players had been segregated as per their nationalities. But overall, my preference remained unchanged. 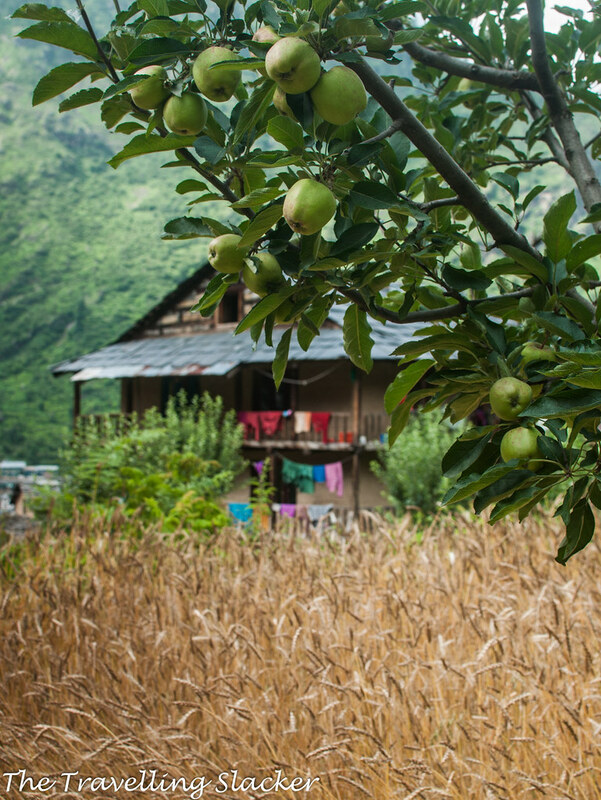 Kalga still remains the best village for me simply because it feels less like a village and more like an apple orchard dotted by a few wooden bungalows. Pulga is surely a better option than Tosh but for me, it can’t beat Kalga. And what about Tulga? Well, it is a much smaller village located somewhere between the other two villages. A very narrow trail goes towards the village from the main trail. We thought of visiting it too but it started raining as we were returning. But I feel it will be more of the same and I don’t think I will return to Parvati anytime soon. So, that one will remain elusive. 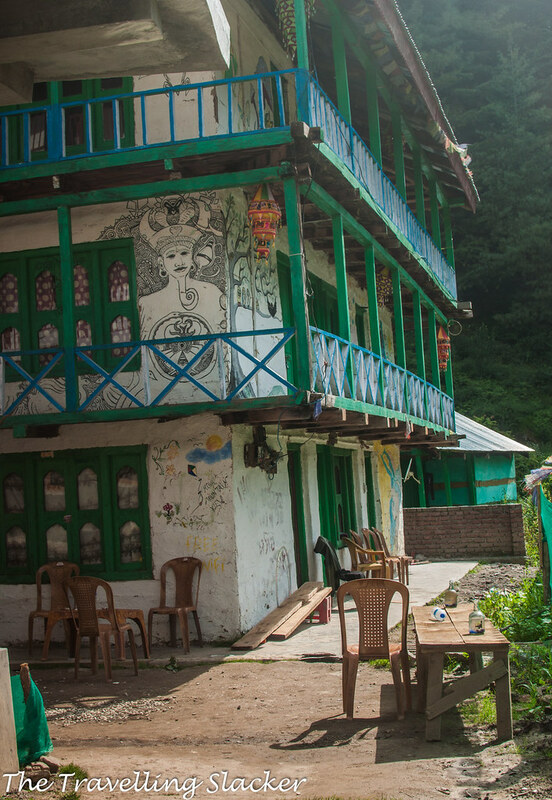 PS: Pulga can also act as the first base for the epic Pin Parvati Pass Trek that takes you to the Spiti Valley that needs no introduction. It is a strenuous trek that nees to be done with an experienced agency. 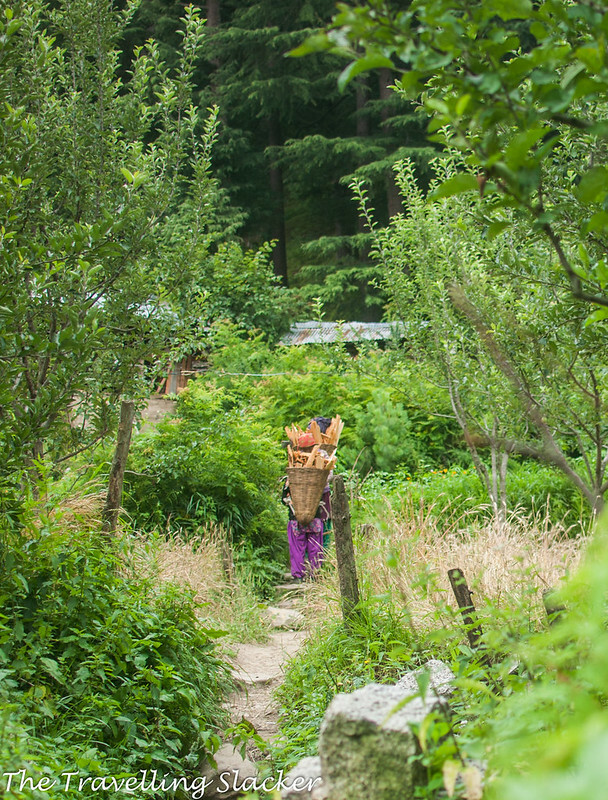 PPS: Read my complete Parvati Valley DIY Guide here. UPDATE (2018): All he commercial activities have been banned atop Kheerganga as per court order. 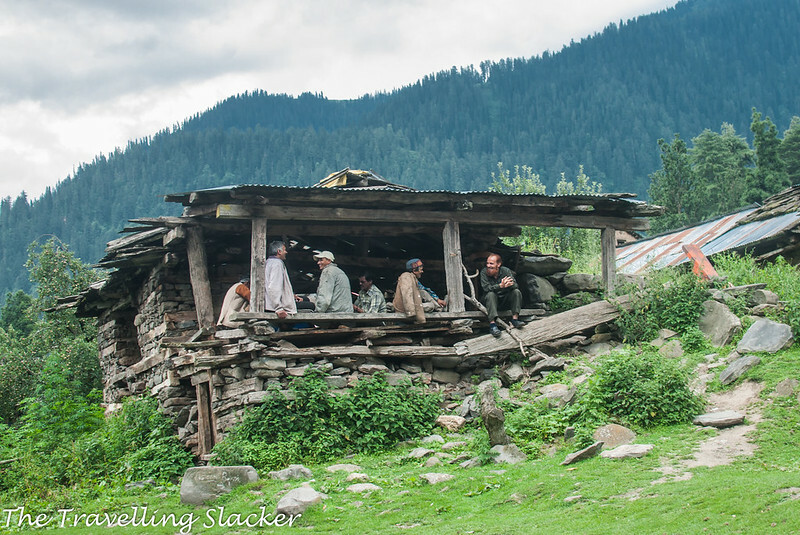 This makes Pulga one of the main bases for a day trek to Kheerganga. Read more about the Kheerganga Ban here. 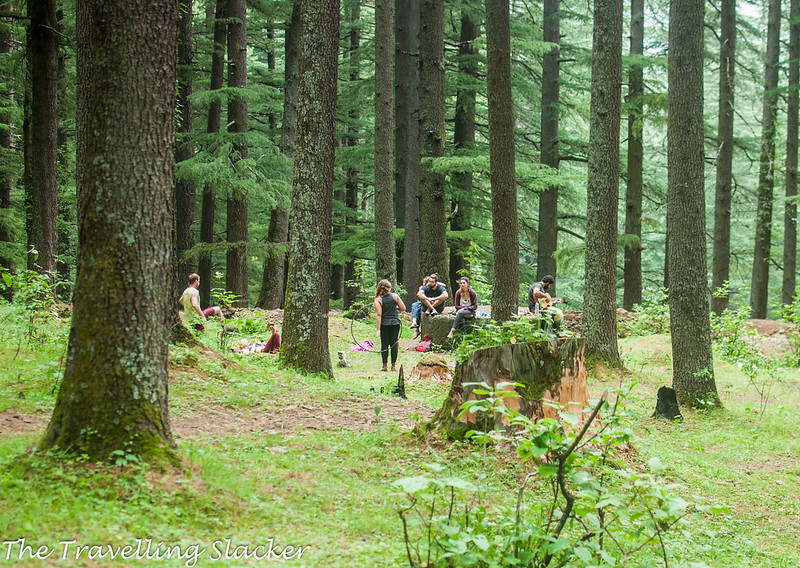 Absolutely love your Himachal posts!! nice pictures, the names Tulga and Pulga seem like two sisters. If its taking you there often am sure its a place to relax and enjoy nature. What is the birding scene there? Pulga looks so amazing and colorful and your captures are stunning focusing on not just natural beauty of this place but showing us the daily activities of the locals as well! The fairy forrest is beautiful and hope it remains that way in coming years! So beautiful place. Great to read about Pulga. I really like how you shine a light on lesser known destinations in India. I appreciate the honesty in your writing. I also agree with you that people come up with attractive names for places that don’t quite live up to the hype (like Fairy Forest)! I can’t imagine imagine how beautiful Kalga is, seeing your photos of Pulga and reading that you prefer the first one better. It looks like such a dreamy village, surrounded by this “fairy forest” where teens play guitar in the woods. The colors of the houses and the beautiful paintings on the walls are so pretty as well! 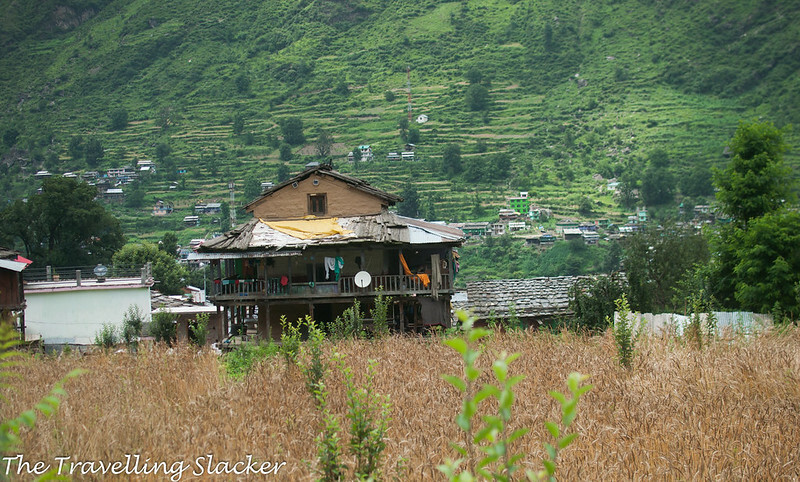 Kalga seems like a beautiful village in Parvati Valley. Although we missed the valley and just went through the outers, but I think I should go back and explore more here. Thanks for sharing such a wonderful post. Beautiful village and nice photography. 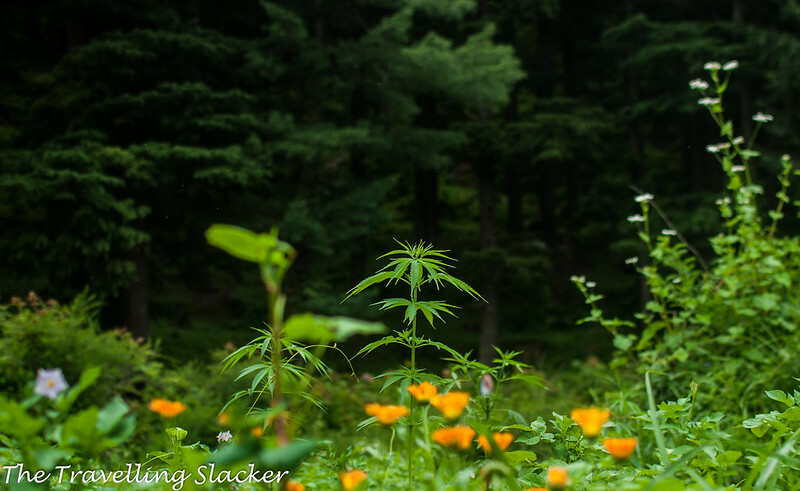 Pulga village in Parvati valley looks really like a fairty tale village with all green grass, tall trees, mountains and lovely locals. 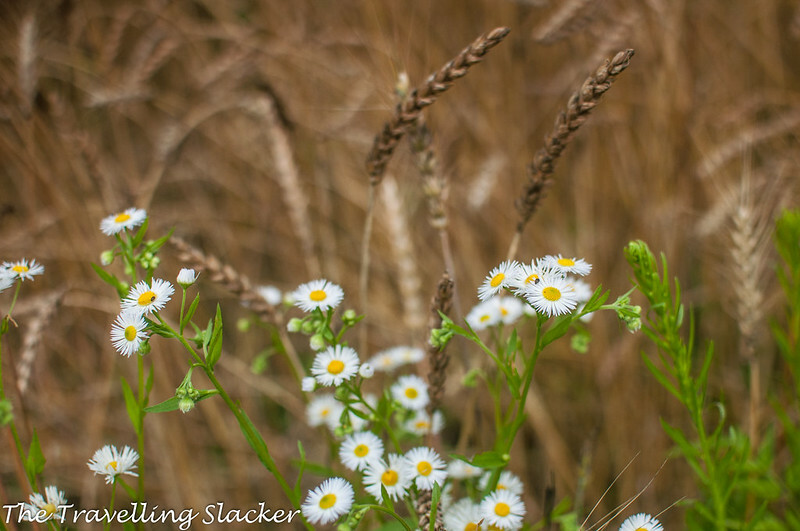 I loved the shot of dry grass in your post. It is good to know that this village is popular among Israel tourist and shops are having toilet paper roll. Beautiful village with great shots. Doesn’t sound like you liked Pulga too much, but it does look pretty cute. I love a fairy forest, even if the fairies don’t show themselves. It’s always nice to take a walk in the woods. Pretty funny about the dreadlocks! Your cover picture one my heart. Nothing likes the smiles of the innocent kids. I love Parvati valley. I am just aching back to go. Last time I couldn’t go to Pulga. This time I really want to. Another lovely post. 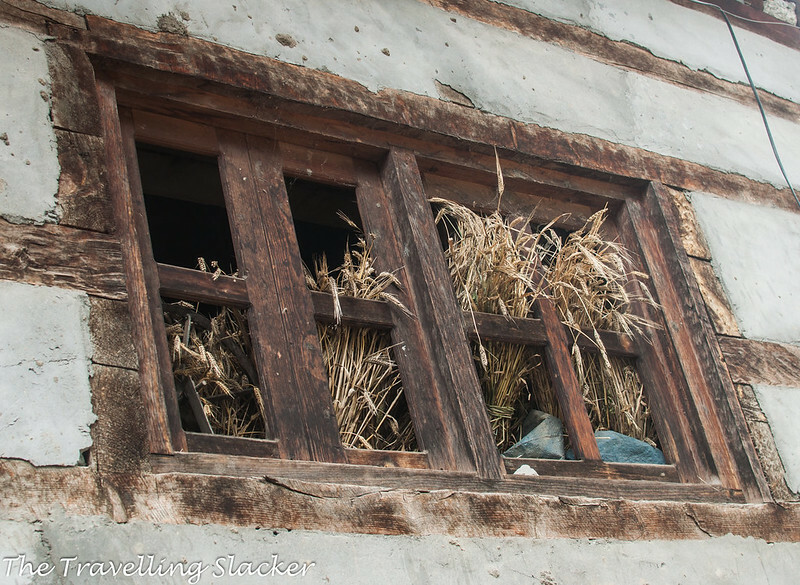 I always like your posts as it shows the beautiful rustic India! Read your post about Kalga. Awesome one. We are visiting Kasol in coming weekend. Could you please help us to make an itinerary. 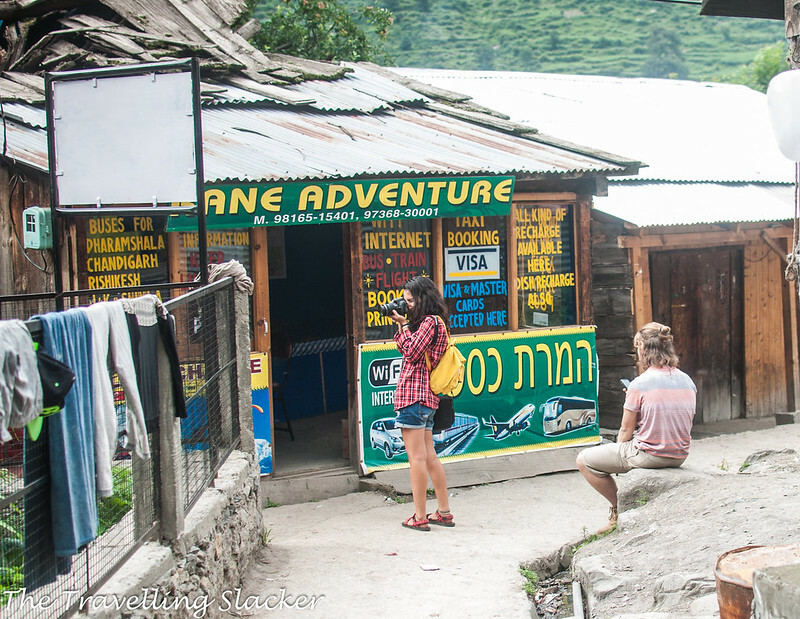 we zeroed to few places around Kasol. 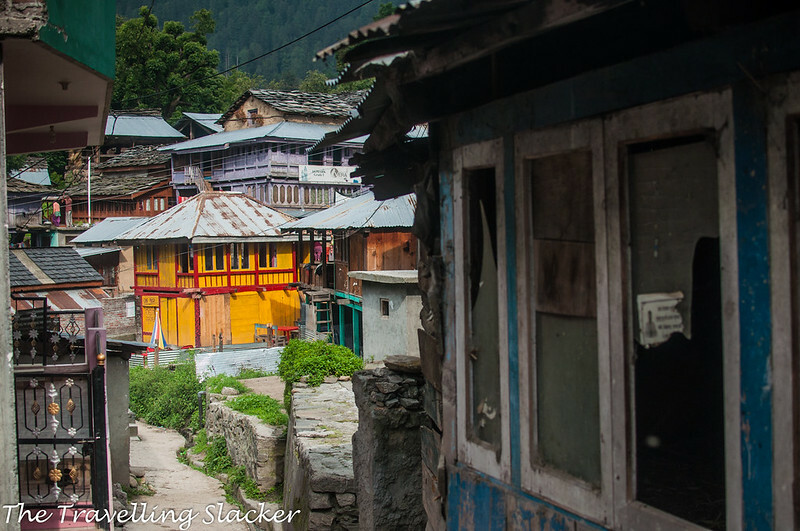 Grahan, Chalal, Malana, Rasol, Manikaran, Tosh , Kalga, Khirganga(like to stay overninight) and Rohtang pass. It is better if we can have some days gap between the difficult treck(Rasol and Khirganga). We will reach Kasol on October 1st morning and we have to leave on Oct 9th evening. How should we plan our trip?. It would be a great help if you can provide your inputs.